From bitcoin to micro loans, there is no shortage of options in the market today for one to look to diversify and to grow their net worth. Of these, investing in the stock market has been the single greatest creator of wealth in the world since its inception. By investing in stocks, investors have the opportunity to own a portion of a business rather than the whole. Thus, the stock market allows growth over time while simultaneously reinvesting dividends to grow one’s investment further. With the ability to own small pieces of multiple companies across many sectors, this diversification is one of the keys to creating wealth over time. Many of the investors we work with at The Palomar Group have been in the stock market for years through investment vehicles such as stocks, bonds, mutual funds, ETF’s, IRAs, and more. But more often than not, they have reached a point where they want to start diversifying their investment vehicles in order to hedge their bets, increase returns, and stabilize their future. To help diversify, we advise investing in Income Producing Commercial Real Estate. While investors are able to buy stocks on margin, it is usually capped at 50%. With real estate, banks will typically allow investors to leverage up to 80% of an asset, greatly increasing the value and quality of the real estate an investor is able to obtain. This also gives an investor the ability to buy more and further diversify their real estate holdings. Instead of buying a single investment property for $500,000, leverage can help investors spread that cash over $2,500,000 in assets. Generally, when an Investment Property with a stable tenant is found, it allows for the rent that the tenant pays to not only pay down a Landlords debt service with no further out of pocket costs to an investor, but also can create additional cash flow that can be used to even further pay down debt, or pocketed as returns to the investor. 5-10 years down the road when an investor sells the $2,500,000 asset, a couple of things have happened: debt has been paid down significantly, the amount of equity in the asset has drastically increased, and the real estate has appreciated in value. As an example, Investor John buys a national fast food restaurant with a new 15 year NNN lease for $2,000,000. The tenant is paying $140,000 in rent with a 10% bump in year 5 to $154,000. John puts down 30% ($600,000) and finances the rest with a 5 year term, 15 year am at 4.25%. With his principal and interest payments at $126,384 per year, his rental payments of $140,000 gives him an additional $13,616 per year that he is able to apply annually towards his principal payment. At the end of year 5 John sells the asset after the rental bump has gone into effect. ​The deal is sold for a 7.5% cap, $2,053,333. After paying off the remaining balance on his loan and recovering his initial $500,000 investment, John is left with a profit of $584,711. While both the stock market and commercial real estate fluctuate with both domestic and global market trends, Commercial Real Estate has always remained fairly stable. One of the reasons for this is that there are actual, tangible assets behind the investment; any significant commercial real estate property is not just land, but a building, infrastructure, and other inherently valuable holdings. Since the value to these assets can never actually go to zero, unlike stocks, there is less of a risk that Commercial Real Estate can crash to the same degree as the stock market and your entire investment lost. Depreciation can be a valuable tool when investing in Income Producing Commercial Real Estate because it allows an investor to spread out the cost of buying the property over decades, thereby reducing each year’s tax obligation. After the passing of the 2017 Tax Reform, Commercial Real Estate has been offered an additional benefit with regards to depreciation. While owners previously had 39 years to depreciate real assets, they now can do it over 25 years giving them an annual tax break overall than in years past. Investing in Commercial Real Estate gives investors much more control over their investment. While the stock market is much more liquid and investments can be moved with ease, there are significant factors that are outside an investor’s control. Without a controlling interest, an investor is not only at the mercy of the leadership and operations of the companies invested in, but the possibility of illicit behavior, deception, or incompetence can significantly affect the value of the investment. With a Commercial Real Estate investment, there is significantly more control over the future of the investment: one can choose the location of the investment, the quality of the tenant, a property that meets the targeted returns an investor is seeking and thus the rent that will be charged, and how long of a lease is in place or will be negotiated by the investor. To clarify, we are not encouraging investors to get out of the stock market. After all, we are heavily invested in the stock market ourselves. However, we are advising current and potential clients to take a look at how heavily allocated their investments are in the stock market. 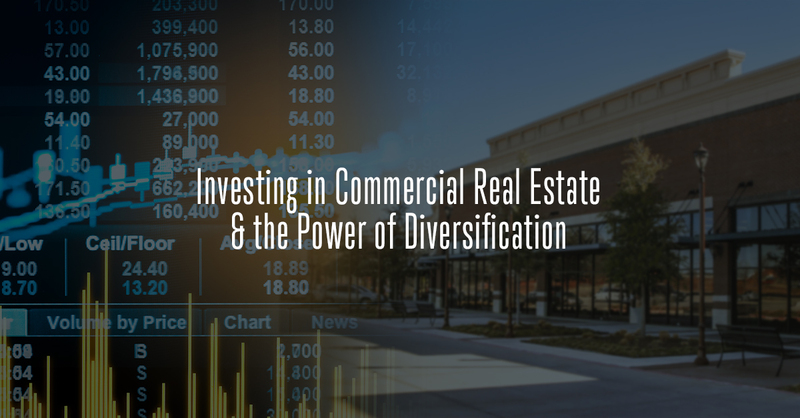 If an investor is at a comfortable level and believes it is the right time for diversification, investing in Income Producing Commercial Real Estate may be the right play.